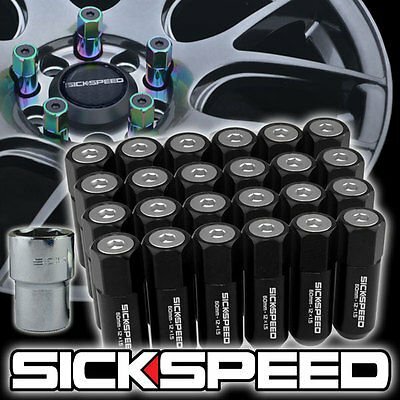 Tuner Series lug nuts from Sickspeed. Forged from aircraft grade 7075 aluminum and hard anodized for long lasting brilliance, these extended lugs have a 60 degree conical seat and feature an open ended design. Weighing in at a mere 38 grams each, you get style and flair while reducing both your unsprung weight and rotational mass. Slim design eliminates the need for spline drive lugnuts One threaded cap per lug / easy to swap out. Uses a 6MM allen wrench for install/removal of cap. (Not included) Lugs are 60mm in length. Comes w key for the included FOUR locking lug nuts! Helps prevent wheel theft!. Made from 7075 aluminum. Lugs weighs 38 grams each. 60 degree conical style seat. Closed end design. Threaded to 12x1.25. Don't forget to check out our other listings for parts and accessories to suit your ride. We are always expanding so keep an eye out for more supreme quality products from Sickspeed. NOTE: Listing is for 24 pieces ONLY. Check our OTHER listings for additional quantities. NOTE: Vehicle list is for REFERENCE ONLY , use the guide above to check fitment with your rims. Thread pitch is 12x1.25 for the above listed vehicles. To avoid damaging your product please use a torque wrench and a 19mm 6 sided socket. under no circumstances should this be installed with an impact driver and or a 12 sided socket. One threaded cap per lug / easy to swap out. Lugs are 60mm in length. Comes w key for the included FOUR locking lug nuts! Helps prevent wheel theft!. If you have any questions about this product by Sickspeed, contact us by completing and submitting the form below. If you are looking for a specif part number, please include it with your message.